The 2018 Access to Medicine Index will be the 6th ranking of the world’s largest pharmaceutical companies on their access-to-medicine performances. We speak with Danny Edwards, Research Programme Manager for the Access to Medicine Index, about how the research team is analysing the latest data to draw out new insights. The Index team has now completed the scoring process for the 2018 Access to Medicine Index. They have assessed the performance of all 20 companies in the Index in detail, ranking them in each of the seven Technical Areas. This assessment is used to develop opportunities for each company, which are tailored toward its business model, pipeline and portfolio in low- and middle-income countries. 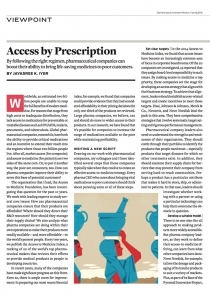 “Even when the aims are similar, companies’ access-to-medicine activities can be very different – comparing them reveals both individual successes and opportunities for companies to do more, as well as an insight into where the industry is heading in terms of access to medicine.” Danny Edwards, Research Programme Manager. To qualify as a best practice, the Index compares company initiatives against four criteria: sustainability, replicability, alignment with external standards and/or stakeholder expectations, and proven effectiveness. “We publish these practices in the final Index report, as well as on each company’s detailed report cards. We also use these practices as the basis for company workshops and roundtables. Last year, for example, the Foundation held three workshops, called the Amsterdam Sessions, for companies evaluated in the 2016 Index,” says Danny. The Index team will conduct a round of peer review with leading technical experts in their fields, before the final report for the 2018 Access to Medicine Index is published in November. The Foundation will then present the findings at events and discussions with investors and academics. The findings will also be used in the Foundation’s ongoing engagement with the companies it measures, with the aim of stimulating and guiding them to further action on access to medicine in 2019 and beyond.